December is time to analyse the results of our investments and look what may happen in the next year. What are the expectations, forecasts and outlooks for 2016? Last IMF projections about the GDP assumed that global economy would grow more than in 2015. India, ex – Soviet Republics (except Russia), Mexico and the developed countries will head this positive evolution. China will grow, but at a lower pace. The worst results are for Brazil and Russia, where there will be a negative growth. Next week Fed meeting will decide about the possible rate hike after 10 years and some think that the US central bank have reasons to do it, as growth and employment are strong in the first economy. However, a rate hike could have negative effects for the dollar, as it would strengthen against the euro (possibly till the parity) and exports would be more expensive. What is given for sure is that the ECB and the BoJ will remain their dovish position due to the weakness of the recovery in their areas. News are not specially good for US stocks, as several experts agree in a low growth or even return decrease in the S&P in 2016. On the other side, European stocks would outperform American ones, although analysts warn about the effects of a weak economic growth in 2016. Oil will still remain weak or even cheaper, if we take into account some forecasts. OPEC countries do not cut their production and US inventories are at the highest level. The downward trend is also sure for the rest of commodities, as Chinese lower growth will condition this markets, because the Asian giant will demand less. What the bonds refer, there will be not much changes, as central banks will still maintain its current policy, apart from the possible Fed exception, whose possible rate hike will not have an enormous effect in the yields. That’s the general market consensus. Of course, life is always open and there can be surprises that can move more positive or negative: the next US president election, the evolution of Daesh and the Syrian war or any outrageous predictions that Saxo Bank typically publish at the end of the year… hopefully, none of them happen. This entry was posted in News and tagged Bond, Central Banks, Commodities, Forecasts, Macroeconomy, Monetary policy, Outlook, Stocks on December 10, 2015 by Oscar Garcia. What stocks and funds were the best in the first eight months of 2014? T-Advisor publishes its ranking taking into account the score. 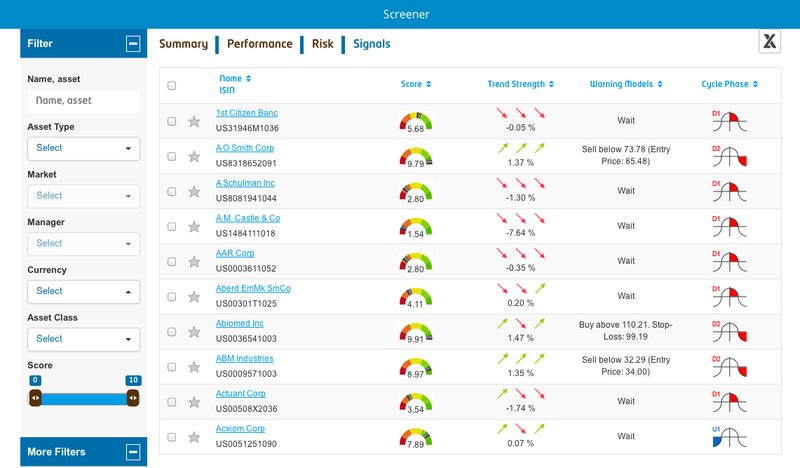 T-Advisor patented score provides an asset rating (bullish, neutral or bearish) based on key performance indicators and technical analysis. This entry was posted in News and tagged August, funds, ranking, Stocks on September 11, 2014 by Oscar Garcia.